Let’s say you decided to lock in an upgrade to Windows 10 Are You a Windows 10 Upgrade Refugee? Do This First! Are You a Windows 10 Upgrade Refugee? Do This First! Did Microsoft just upgrade your computer to Windows 10? Since February, Windows 10 is being pushed as a Recommended update on Windows 7 and 8.1 computers. This is what you can do after you've been... Read More , but you didn’t actually do the upgrade. Whatever your reason for waiting, it looks like Microsoft is going to push the update out to you whether you’re ready or not! Thankfully, you can cancel the upgrade relatively easily. First, go to this Microsoft page and download the troubleshooter linked to on the page. When you run it, you’ll have the option to Continue Upgrade as Scheduled or Upgrade Later. Since you don’t want Windows 10 right now, you’ll need to click the Upgrade Later option. 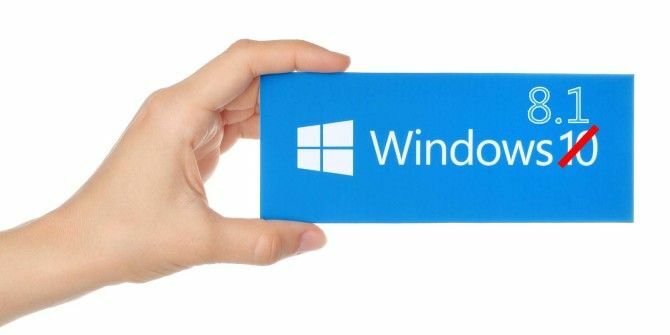 The app to upgrade to Windows 10 should remain in your system tray, so when you do decide you want to get your upgrade, you’ll be able to, it just won’t be forced on you. What’s keeping you from getting Windows 10 on your PC? Let us know in the comments! The New Microsoft Edge Insider Channels: All You Need to KnowAre You Confused by the Windows App Terminology? No, sir: nVidia's updated drivers will not work. I tried the last 2 or 3 updates, including the latest, in attempting to resolve. I also used the driver that was on HPs site, for the machine. Does not play well with Win10 @ all. I apologize about the confusion of the CD/DVD terminology: Yes, Win10 is on DVD, I was not using correct wording. Troubleshooter doesnt seem to work on my PC, is there an exception for OEM Windows 7? A better way is to use the GWX Control Panel; with this small app, you can turn off the GWX (Get Windows 10) update completely, remove the downloaded files (about 3GB), and take control of your upgrade choices. I am leery of privacy issues with Win10,the fact updates are pushed without your ability to control what to accept,and as Kevin has already mentioned,you could run into compatibility issues. I will stay with Win 7 for now. The primary reason I have not updated to Win10, yet, is coz my 2 machines will not accept it. As an experiment, I forced the win10 on my older, win7 machine, using win10 iso. Everything worked great, except my Geforce vid driver is totally incompatible. Win keeps crashing, halting or restarting the system. It now has Linux, Ubuntu Studio on it. My current machine is a win8.1, same manufacturer, but I'm hoping when I attempt to use the CD to load win10 on it, the vid driver will not be an issue. If you do want to run Win10, it's best to collect all the drivers you'll need ahead of time, including the very latest nVidia drivers. Guess I wasn't clear: what I mean is INSTALLING win10 from the CD, since the Win8.1 pc will not successfully update to win10 using the "windows update" route. It fails every time. Neither HP, Microsoft, nor any forum that I've visited has a solution. I can only attempt to install from CD in that case. That's odd; so updating to a nVidia driver from their site wouldn't fix it? I had a similar problem with an AMD Radeon 7000 card - Microsoft's drivers worked fine, but with poor performance, while AMD's driver caused text to have little fuzzy "dancing" pixels around it. "No, sir: nVidia’s updated drivers will not work. I tried the last 2 or 3 updates, including the latest, in attempting to resolve. I also used the driver that was on HPs site, for the machine. Does not play well with Win10 @ all. I apologize about the confusion of the CD/DVD terminology: Yes, Win10 is on DVD, I was not using correct wording. "